No one likes to admit to snoring. However, if your snoring is loud and troublesome to your sleep, it may mean a serious issue. You might just have what’s called sleep apnea, a sleep disorder where breathing will frequently stop and start. If you’re a man over 25, it is a must to learn about the types of sleep apnea, as well as symptoms and helpful treatments. Because obstructive sleep apnea and central sleep apnea share similar symptoms, it’s hard to detect the type you have. Overall, the most common nighttime symptoms are loud snoring, abrupt awakenings, insomnia, and breathing cessation. During the day, you may experience a dry mouth, sore throat, headache, extreme fatigue, irritability, and difficulty paying attention. Obstructive sleep apnea happens when your throat muscles relax and block your airway during sleep and is the most common. When the throat muscles relax, such as with obstructive sleep apnea, the airway closes as you breathe in. Therefore, you can’t get enough breath in and risks lowering the level of oxygen in your blood. Your brain will sense this inability to breathe and wake you, so you can start breathing again, but this is so brief that you’re not likely to remember it in the morning. Central sleep apnea happens when your brain isn’t sending the right signals to the muscles that control breathing. You may wake up with shortness of breath and have a hard time getting back to sleep. The last type is complex sleep apnea syndrome or treatment-emergent central sleep apnea, is a combination of the two. What should I do about symptoms? See your doctor instantly if you are experiencing at least three of these symptoms. Have your partner or friend observe and write down your sleep patterns and see if they notice these abnormalities too. These include snoring loud enough to disturb their sleep, and your own sleep, shortness of breath, intermittent pauses of breathing during sleep, gasping or choking that awakens you, and severe daytime drowsiness. Snoring that is followed by long periods of silence should especially alarm you. Ask your doctor about the sleep problems that correlate with your symptoms. You might find your symptoms relate to another sleep disorder such as hypersomnia or narcolepsy. Be as specific as possible so your doctor can properly diagnose and treat you. Have your partner or friend come with you to help describe the symptoms you’ve been showing. The risk factors for obstructive sleep apnea and central sleep apnea vary. Obese individuals are four times more likely to get sleep apnea. This is because fat deposits around your upper airway may obstruct breathing. It is a hit or miss though since not all overweight people get sleep apnea. People with thicker necks have narrower airways, increasing the possibility of blockage. Men should have a neck circumference of no larger than 17 inches (43 centimeters). Enlarged tonsils and adenoids also obstruct the airway. However, your airway may be naturally narrow due to heredity. Men are twice as more likely to develop sleep apnea than women. Sleep apnea occurs more frequently in older adults as opposed to children. If any of your family has sleep apnea, you are automatically at a higher risk. Substances such as alcohol, sedatives, and tranquilizers relax the muscles in your throat which may lead to this type of sleep disorder. Smoking cigarettes can cause fluid retention and inflammation in the upper airway, so it makes sense that smokers are three times more expected to obtain obstructive sleep apnea. A breathing difficulty, specifically through your nose, makes you more likely as well. Central sleep apnea occurs in older people as well, but heart disorders and narcotic pain medications are two risk factors that are only associated with this type. If you’ve suffered from a stroke, you are more likely to get central sleep apnea or complex sleep apnea syndrome. Complications due to these symptoms include daytime fatigue, trouble concentrating, irritability, high blood pressure, insulin resistance, metabolic syndrome, and liver problems. Your doctor might want to conduct a sleep study before giving you any medication. A sleep study observes several bodily functions as you sleep, like eye movement, heart rate, and airflow, among others. This test is held in a sleep center and is used to figure out if a person has sleep apnea and how severe it is. Normal treatment is a continuous positive airway pressure device (CPAP) when you are diagnosed with obstructive sleep apnea. 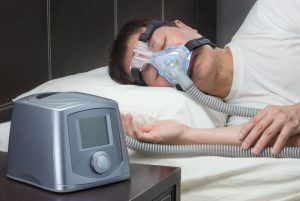 The CPAP is a mask that covers your nose and/or mouth and will gently release air into your airway to keep it open while you are asleep. This treatment produces great results. More methods include hypoglossal nerve stimulation, dental appliances to reposition the tongue and lower jaw, and surgery for the upper airway. These might all sound bizarre and frightening, but lifestyle changes can be effective for symptoms too. Some easy changes you can make are to follow a nutritious diet and exercise program for weight loss, stop smoking, limit drinking, and visiting your cardiologist regularly. While medication is not usually the go-to option for sleep apnea, some drugs can help with daytime sleepiness, such as Provigil (modafinil), Nuvigil (armodafinil), and benzodiazepines. Over the counter medications should be instructed by a physician like Sominex, Nytol (diphenhydramine), and Unisom (doxylamine). Some nasal decongestants found in drug store can treat mild snoring related to sleep apnea. Snoring is normal, but sleep apnea is a serious medical problem. Despite the shame you might feel, it’s estimated that 22 million Americans suffer from sleep apnea, but since most cases go undiagnosed, it is crucial to look at the symptoms and see your doctor. Bedtime is for relaxing and recharging. You should always have a comfortable good night’s sleep that isn’t interrupted by sleep apnea.